Pens have a ubiquitous presence in our environment which makes them well suited as promotional items. We’ve all seen pens with business names and logos inscribed upon them as a means of advertising. Sometimes the inscriptions are more meaningful and are intended to commemorate an event or recognize outstanding performance or participation. Pens also serve this purpose well because they are so useful in our day to day lives. We saw this with the Lagostina M150 where a company contracted with Pelikan to have a special, limited production pen made for exclusive distribution. In this example, the pen was created as a gift for the management of the Italian cookware company Lagostina during the early 1980s. In similar fashion, Pelikan has supplied pens to their employees on occasion to commemorate certain achievements or milestones. One such event was the 25th anniversary of the opening of the manufacturing plant at Peine-Vöhrum, Germany. A look back at Pelikan’s history tells us that, in 1906, administration and production space was moved to Hannover on the Podbielskistraße. 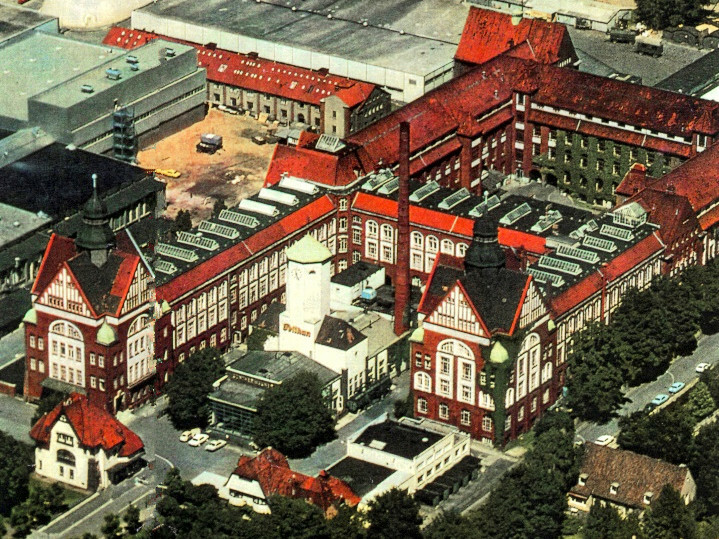 In 1973, it was determined that the facilities on the Podbielskistraße were inadequate and could no longer be expanded to meet the company’s needs. Production was then moved to Peine-Vöhrum, 24 miles east of Hannover, where it remains today. The former plant was ultimately made into the Sheraton Hannover Pelikan Hotel where visitors can stay in one of 147 rooms and see remnants of Pelikan’s heritage. The year 1998 marked the 25th anniversary of the move from the Podbielskistraße plant. To commemorate that anniversary, Pelikan gave employees of the Vöhrum manufacturing plant a Snakeskin patterned set which consisted of a specially engraved R200 rollerball and K200 ballpoint pen. The Snakeskin pattern was a limited edition originally made for Office Depot in the USA sometime in the mid to late 1990s. The body of the ballpoint and cap of the rollerball were engraved with Pelikan’s two chick logo and the phrase “25 Jahre Pelikan, Peine – Vöhrum 1998” which translates to “25 Years Pelikan, Peine -Vöhrum 1998.” These engraved sets were very limited in production and not for sale to the general public. A fountain pen was not provided to the workers as part of the set but at least one such cap engraving has been found on a fountain pen which allows us to speculate about its origin. The pen in question was made of a mash-up of pieces and it is my suspicion that it is something that was put together by one of the workers who wanted a fountain pen instead of the company sanctioned offering. This rogue fountain pen model has a pre-1997 M600 piston knob & barrel with the engraved pre-1997 R200 cap. The nib is 14C-585 monotone gold from an M250. The year 1998 came right after the transition to the new, modern trim styles which included an increase in the size of the M600. It seems reasonable to assume that workers had access to a lot of spare parts from models that were no longer in production from which they could have assembled a fountain pen such as this. While it may never have been official or company sanctioned, it makes for a neat fountain pen whose interesting history we can only muse about. You did it again, Joshua. What a lovely piece of history to learn. Thanks for the enlightenment. Of course, I have to ask, do you have any of these three pieces? I have the unusual frankenpen at the bottom of the post that I came across a few months ago. I also have the non-engraved snakeskin rollerball that came out in the mid-1990s. The matching fountain pen has been one of my great pen quest.